Today was Day #7 of Chocolate, Seeds and Berries Theme Week. It was a frosty January day today, but the sun was shining. 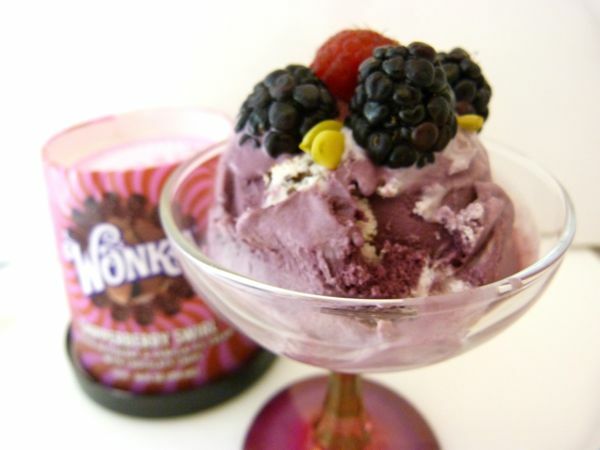 So it seemed like a good day for some ice cream. Wonka Chipperberry Swirl -- black raspberry and vanilla ice cream with chocolatey chips, from Dreyer's Grand Ice Cream (Oakland, CA) -- to be precise. 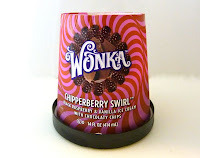 Designed to sit, and be read, upside down, this Wonka just-shy-of-a-pint-size-container was covered with snazzy berry colored swirls. The ice cream inside was a more soothing and edible version of this swirl pattern, with authentic tasting black raspberry and vanilla ice cream -- the kind I remember from childhood, peppered with small chocolate flecks. Topped with fresh berries, and a few sunflower and pumpkin seeds, and I was ready to call this dessert.